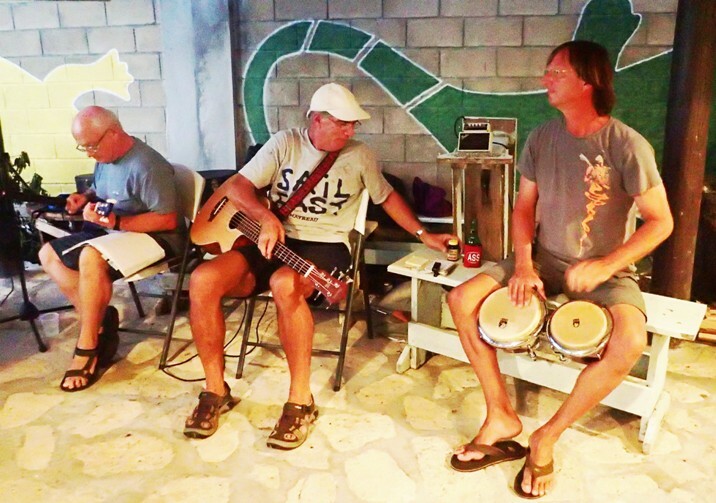 Galene goes West: Carriacou Once Again! We left Clifton in light winds and had a lovely calm sail with 1 reef in the main and full genoa and mizzen. The only downside (there always has to be one!) is the wind speed indicator is working intermittently. 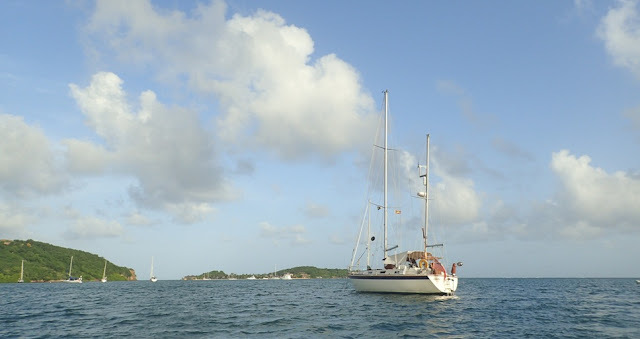 We dropped anchor in Tyrell Bay at 13:15 having sailed 13 miles in 3 ¼ hours. We planned to go to the Petit Martinique Regatta the next day so it was a rush round to check in, drop the laundry, get water and do some grocery shopping. For supper we walked up for Miss Luckys amazing chicken and chips. 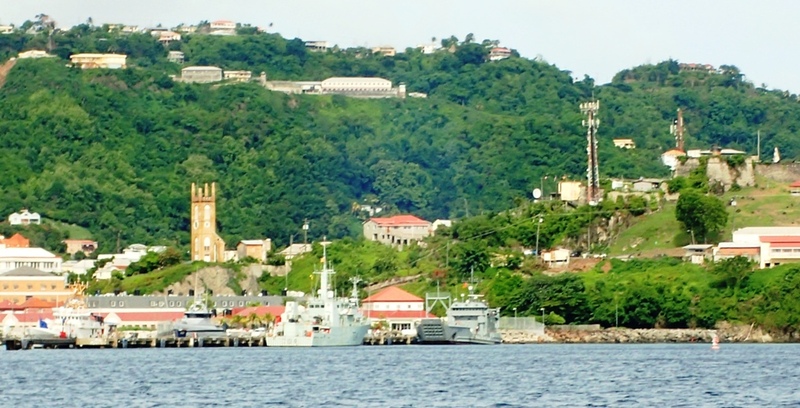 Looking out to Petite Martinique - Pity we didn't get there! Saturday we woke to heavy cloud and squalls but eventually left at 11:30, still plenty of time to complete the 15 mile journey. We made it to the top of the island in gusty winds and rough seas, reefing the main again and narrowly missing many pot markers. Then we saw another huge squall coming. We would have had to sail directly into it when we turned towards PM and the anchorage is not very sheltered anyway, so we turned tail and headed back to Tyrell Bay. At 14:45 we were back at anchor having sailed 17 miles in 3 ¼ hours and moved 20 yards! Sorry to have missed the regatta weekend, we settled into normal Carriacou life once again: water aerobics, Mexican train dominos, catching up with friends at sundowners on various boats and dinners ashore, watching cricket (Mainly IPL now) at Iguana Bar, snorkelling and Richard really getting into his ukulele with regular music practice with other cruisers. 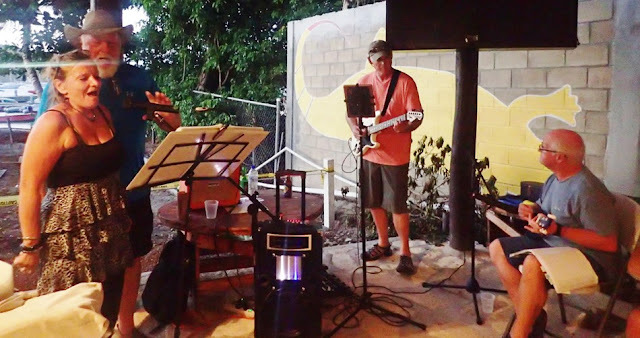 They played several evenings at Levis Bar which is an open mic evening with karaoke, but everyone preferred the band. For our last Thursday evening the Tyrell Bay Choir, as the named themselves, played at pizza night at the Iguana Bar. It was a fantastic evening, a 6 piece band, occasional guest vocalists, and great pizza. Amazing we were all in tune and in time! The next day everyone started leaving, some for Trinidad and some for Grenada, all getting prepared for the hurricane season. Sunday 12th June was our planned departure date and we woke to strong wind and heavy rain! Once again, not what was predicted. However, it all calmed down and we raised anchor at 0900 for another lovely sail down to Grenada with a pilot whale sighting the highlight of the day. We arrived to find the Navy in town - Not an invasion but a combined coastguard excercise! We dropped anchor in Martins Bay just outside St. Georges at 15:45, 37 miles in 6 3/4 hours. Glad to be here so we know we will be in Clarks Court Bay in time for our hail out on 27th. After an excursion to town on Monday we returned to find that Galene had dragged! Fortunately not into another boat. The holding is notorious here, rubble over shallow sand. It took us five attempts this time before we were happy. 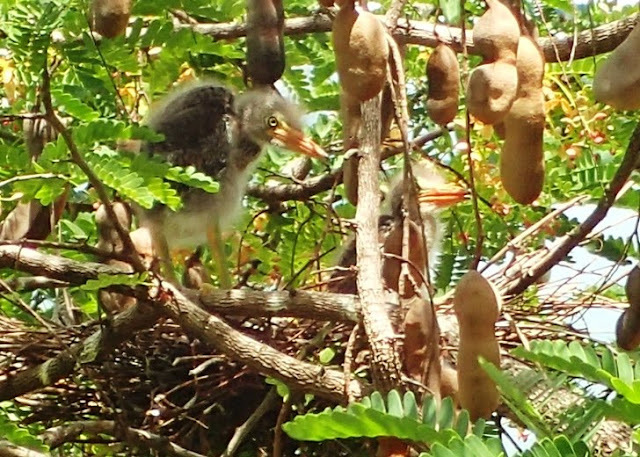 Baby Green back Herons in a Tamarind tree next to the Grenada yacht club. This was taken from the balcony! Now it was time to get ready to leave Galene - try to eat up all the perishables, clean everywhere and spray for insects, but in between still socialising with other boats, quite a few who were in Tyrell Bay with us and some that arrived from elsewhere. Saturday 18th we left for Clarks Court Bay. A fair sail to the bottom of the island then very lumpy and unpleasant all along the bottom with one big squall with heavy rain. We were anchored in 10m off Rocky Point by 12:50 having sailed 13 miles in 3 hours. We now have a week to get all the sails off before our haul out. Sounds fine, but the forecasts are never accurate so you have to get up each day and if it is calm, quickly get a sail down. Hard for Rowena as she was still in pain and tired from the Chikengunya, and the anchorage was very rolly and uncomfortable so we were being battered around most days by wind and swell as well. Anyway, we got it all done and moved into the haul out dock on Sunday afternoon and removed the Bimini and all the shade covers as well. 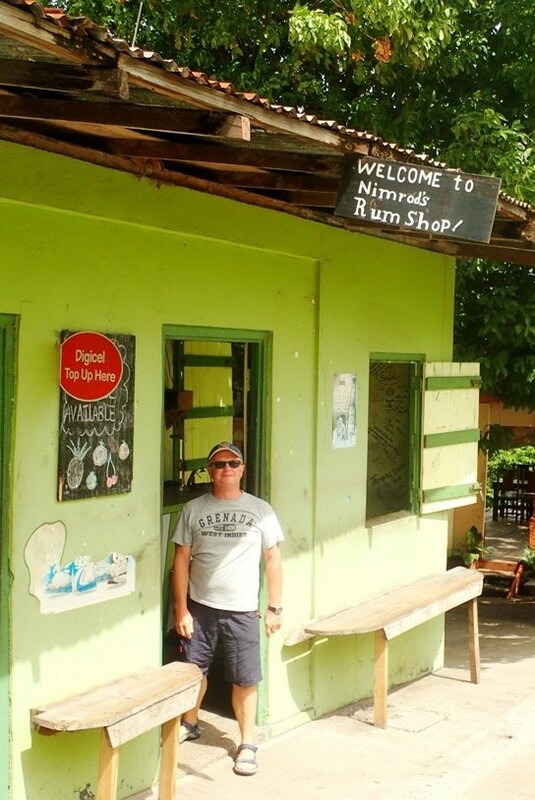 Unfortunately the restaurant in the boatyard was still not open so we really had to plan our meals the last few days. Conviently this is the bus stop for the bus from Woburn to St Georges! Monday 27th our lift was booked for 08:00, so we were up early and ready. 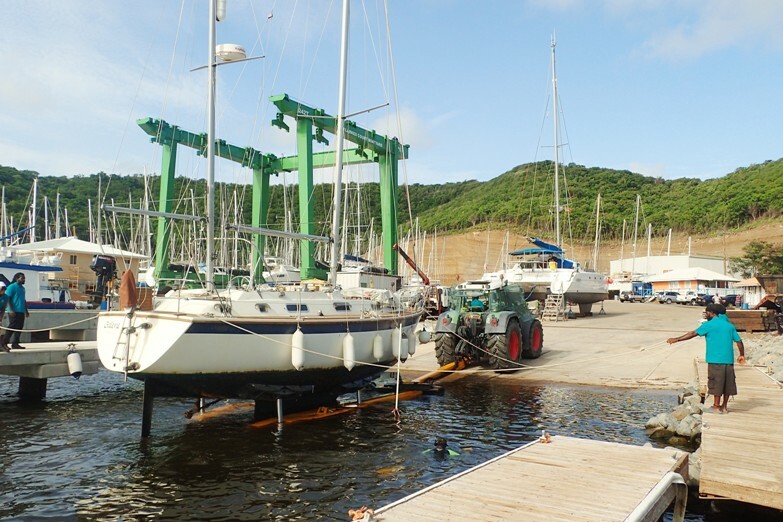 The boatyard staff were there early too, the trailer having been left in place on Saturday at the end of the day. The haul was very efficient; they even have two divers who ensure the straps are in the correct place. Galene was pressure washed and moved to her spot at the end of the yard, under the cliff which looked very safe, and tied down. We went up and did the final checks, put a shade tarp over the cockpit and were showered and ready for lunch by 12:30. Donna brings lunches to the boatyard from her little cafe up the road, so we made sure we had ordered the day before. Then it was a taxi to the airport, a bit early but nice to relax with a beer and wait for our flights to England.